What sets this volume apart from other mathematics texts is its emphasis on mathematical tools commonly used by scientists and engineers to solve real-world problems. Using a unique approach, it covers intermediate and advanced material in a manner appropriate for undergraduate students. Based on author Bruce Kusse's course at the Department of Applied and Engineering Physics at Cornell University, Mathematical Physics begins with essentials such as vector and tensor algebra, curvilinear coordinate systems, complex variables, Fourier series, Fourier and Laplace transforms, differential and integral equations, and solutions to Laplace's equations. The book moves on to explain complex topics that often fall through the cracks in undergraduate programs, including the Dirac delta-function, multivalued complex functions using branch cuts, branch points and Riemann sheets, contravariant and covariant tensors, and an introduction to group theory. This expanded second edition contains a new appendix on the calculus of variation -- a valuable addition to the already superb collection of topics on offer. 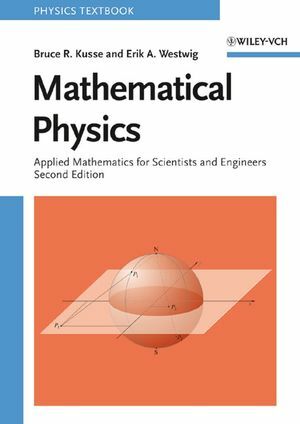 This is an ideal text for upper-level undergraduates in physics, applied physics, physical chemistry, biophysics, and all areas of engineering. It allows physics professors to prepare students for a wide range of employment in science and engineering and makes an excellent reference for scientists and engineers in industry. Worked out examples appear throughout the book and exercises follow every chapter. Solutions to the odd-numbered exercises are available for lecturers at www.wiley-vch.de/textbooks/. Bruce Kusse is Professor of Applied and Engineering Physics at Cornell University, where he has been teaching since 1970. He holds a PhD from the MIT in electrical engineering with a specialty in plasma physics. Erik Westwig is a software engineer with Palisade Corporation, New Jersey. He holds an MS in applied physics from Cornell University. "Any lecturer on mathematical methods is also looking for worked examples and numerous exercises. This book passes these tests admirably. [...] In summary, a welcome addition to the good books in this area." Covers applications in all areas of engineering and physical sciences. Features numerous figures and worked-out examples throughout the text. Presents mathematically advanced material in a readable form with few formal proofs. Organizes topics pedagogically in the order they will be most easily understood. Provides end-of-chapter exercises and offers free solutions manual for lecturers (available from the publisher). New to this second edition is an appendix on the calculus of variations - a valuable addition to the excellent choice of topics.